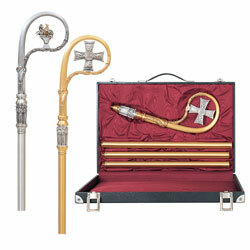 Elegant Bishop's Crozier with Agnus Dei (lamb) symbol and six adorning angels on the node slightly oxidized. Crook section is richly textured metal with soft finish on 3-piece shaft and rubber tip on end. 71" height. Includes a sturdy lined case with lock and key. outside diameter dimensions: 20" x 13-3/4" x 3-1/2" deep. 24K gold plated. Silver plated also available.